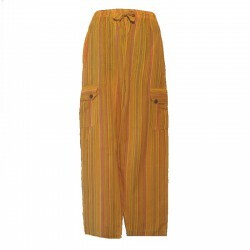 Cotton trousers harem pants with fine stitched seams, made in India. Zip closure with 1 button on the right side, elastic at the bottom of the legs, 2 pockets at the back.Original ethnic harem pants with pretty hippie chic style. Striped trousers 100% cotton, elastic waist and tightening twine. Straight cut, two open pockets on the sides, 2 side bellows pockets with flap closure and coconut buttons, 1 pocket on the back. Ethnic pants comfortable to wear. S/38 size. Striped trousers 100% cotton, elastic waist and tightening twine. Straight cut, two open pockets on the sides, 2 side bellows pockets with flap closure and coconut buttons, 1 pocket on the back. L size. Ethnic pants comfortable to wear. Striped trousers 100% cotton, elastic waist and tightening twine. Straight cut, two open pockets on the sides, 2 side bellows pockets with flap closure and coconut buttons, 1 pocket on the back. Ethnic pants comfortable to wear. XL size. 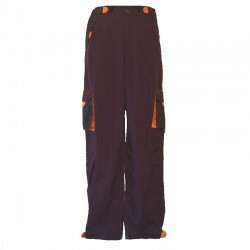 Pants made of parachute silk, lightweight, durable, effective windbreak and assured comfort. zip and press stud, 2 welt pockets, 2 zipped bellows on the sides and 2 pockets on the back. Scratch on the lower legs. 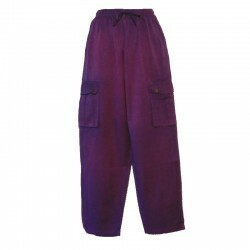 Men's trousers 100% plain cotton, ethnic trousers Nepal.Straight cut, elastic waist and tie string, 2 raglan pockets on the sides, 2 bellows side pockets with flap closure coconut buttons. 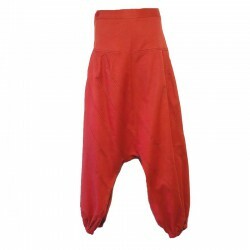 Light and resistant trousers made of parachute silk. Windbreaker pants comfortable to wear.Zip closure and snap, 2 pockets caught in the seams with Velcro flap, two pockets bellows on the sides and 2 pockets on the back. Scratch on the lower legs. Striped trousers 100% cotton, elastic waist and tightening twine. Straight cut, two open pockets on the sides, 2 side bellows pockets with flap closure and coconut buttons, 1 pocket on the back. Ethnic pants comfortable to wear, size M.